The five nos appeared soon after unrest in the Middle East and North Africa inspired some in China to attempt their own “Jasmine Revolution” to call for liberal democracy. The government promptly cracked down on potential demonstration sites and detained online organizers. “Five nos” was censored from Weibo search results in the run-up to the 2013 National People’s Congress. Netizens invoke the five nos to mockingly chastise those who argue for liberalization. 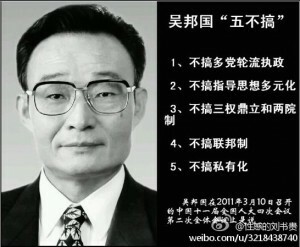 For instance, on February 14, 2015, the businessman Ren Zhiqiang shared an essay on Weibo about his personal definition of Western values. One netizen commented, “There’s no use in saying all this. One ‘five no’ and they’ll shoot you down” (说这些都没用，一句五不搞就把你顶回来了). Want to learn more subversive netizen slang? 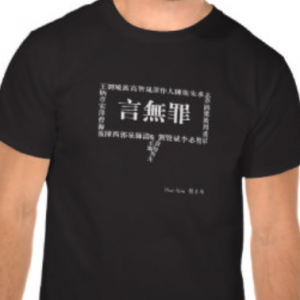 Check out Decoding the Chinese Internet: A Glossary of Political Slang. Available for $2.99 in the Kindle, Google Play, and iTunes stores. 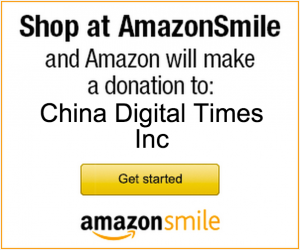 All proceeds from the sale of this eBook support China Digital Times.